First of all, I’d like to apologize to anyone who got snookered into paying a hundred bucks for Mayweather vs. Pacquiao back in May. 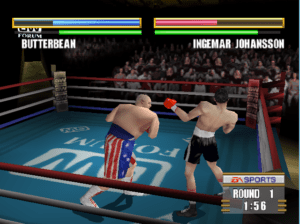 That being said, boxing seems to have the widest gulf between the quality of entertainment the games provide and the quality of the actual sport; I’d much rather play the Fight Night franchise than watch 99% of actual boxing. 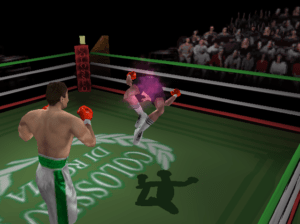 Before there was Fight Night, though, EA’s flagship of fisticuffs was Knockout Kings, including today’s game, Knockout Kings 2000 for PlayStation. 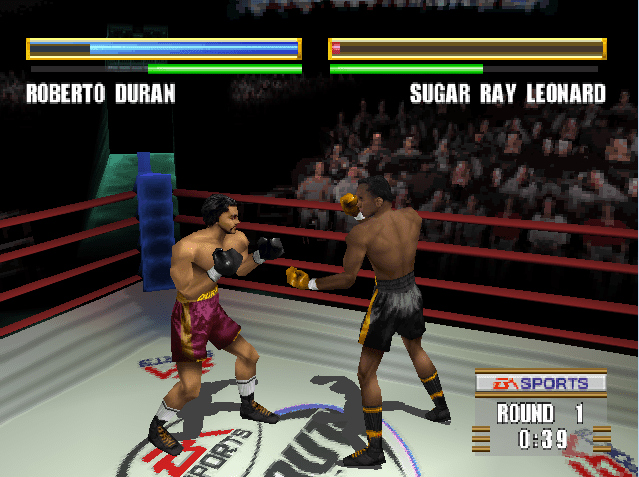 Rewrite history and make Sugar Ray say “No Mas”. KK2000 features several ways to throw down: you have your standard exhibitions, the more arcade-style Slugfest, complete with glowing fists and wacky one-punch knockdowns, Career Mode, where you create a fighter and build him up through the ranks of one of the three weight classes, and Classic Fights, featuring legendary bouts like Ali-Frazier III, Hagler-Leonard, and even super throwback fights like Ingemar Johansson v. Floyd Patterson, each with a bit of backstory provided. You can also read bios and check stats and other attributes for each of the featured fighters. Speaking of which, the roster here is positively LOADED. Aside from the obvious choices like Ali, Frazier, Sugar Ray Leonard and such, there’s also a pretty good cross-section of contemporary fighters like Oscar De La Hoya, Floyd Mayweather (pre-douchebag era), Julio Cesar Chavez, and Evander Holyfield, as well as old-school sluggers like Jake LaMotta, Rocky Marciano, and Archie Moore. 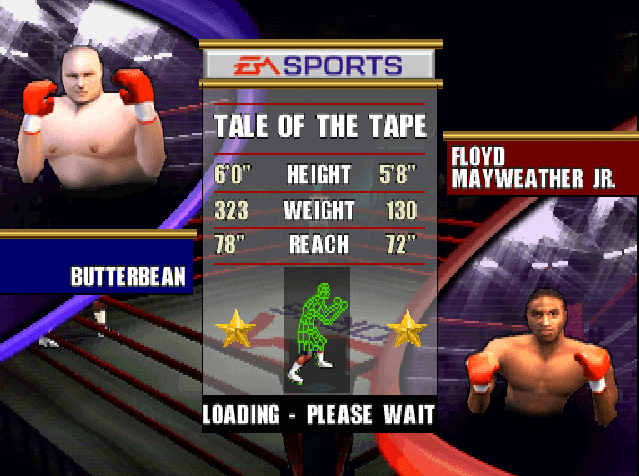 Even Toughman icon Butterbean makes an appearance here, for those that just want to trade shots with no regard for speed or technique. When you get down to the ring, you’ll find that the range of things you can do quite impressive. Square and X control your lead hand, Circle and Triangle your power hand. L2 and L1 block low and high, and different combinations of the shoulder buttons control action like clinching, cheap shots, and kneeling down to save yourself from being knocked out. Fighters fall into one of two categories, boxers and sluggers, who have different basic punches, as well as different combinations, which take up less stamina than flurries but require a bit of timing to pull off successfully. YOU DON’T WANT NONE OF THE BEAN, SON! One thing you’ll have to come to grips with early, however, is that trying to overwhelm your opponents with punches without putting up an iota of defense is going to get you knocked out lickety-split. Even on the lower difficulty levels and against statistically inferior opponents, the CPU is aces at exploiting mistakes and punishing you for them. Furthermore, it is entirely possible to punch yourself out entirely, and while you’ll still be able to throw punches with no stamina, you’ll move slower, be more susceptible to damage, and your attacks will have as much effect as trying to bludgeon someone to death with a piece of construction paper. That being said, this can also work to your advantage, as a steady diet of body blows and smart defense will wear your opponent out, allowing you to capitalize in the later rounds, which can save you in many a fight in Career Mode. Fighters can also be busted open, which amplifies damage taken to that part of the face, although sadly, you can’t open a cut up badly enough to have the fight stopped, which would’ve been a nice nugget of realism. As for the aforementioned Career Mode, it’s your basic march up the rankings while upping your stats in the process type affair, but there are some interesting features to be found along the way. 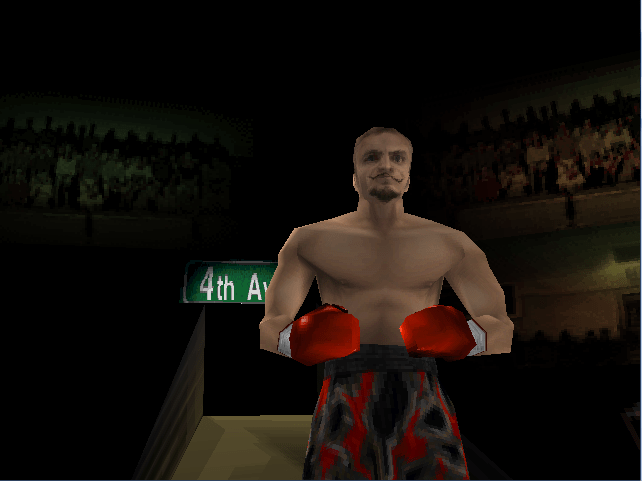 You start by building your fighter, choosing his weight class, trunks, gloves, and the extremely generic nickname he’ll be referred to for the rest of his career, allocating some skill points, and selecting a gym, which is surprisingly important, as different gyms provide extra stats in certain attributes, in some cases, at the slight expense of others, so one gym might add 3 power, but at the expense of 1 speed, and so on. Here, we see Barry McGuigan has been consumed by the Dark Souls from Shadow Man. You’ll start off fighting tomato cans named after the producers of the game in first-fight-on-the-card matches in grungy bingo halls even ECW wouldn’t have run shows in. After each fight, you’ll also have the opportunity for interactive training, where you practice different sets of moves like flurries or illegal punches, for a little extra ratings boost. As you climb the ladder, you’ll start to unlock bonuses such as turning certain punches into signature punches, and specialty moves you can bust out for big punishment. You’ll work your way up to better arenas, as well as better ring announcers and having Mills Lane as your referee, and along the way, you’ll bump into a few fighters who really shouldn’t be fighting. 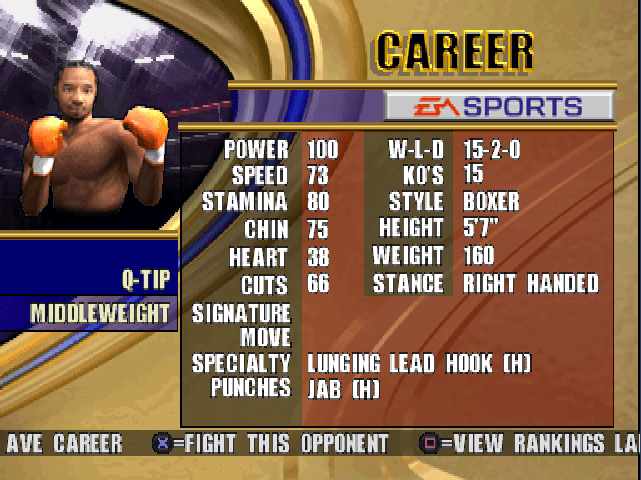 For example, in the middleweight ranks, I had to fight both Marc Ecko and Q-Tip from A Tribe Called Quest (!). 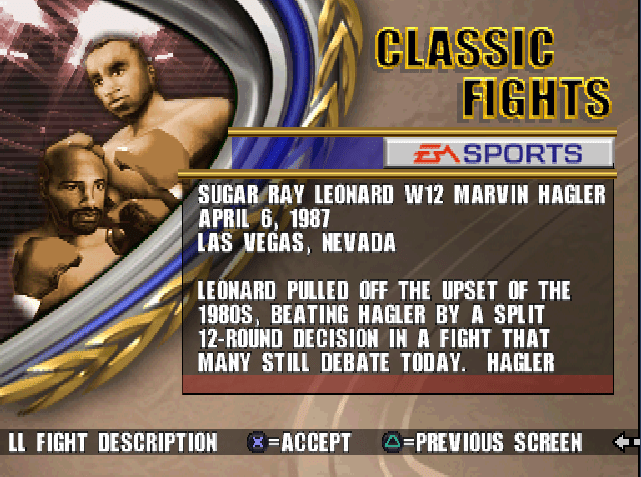 Eventually, you’ll work your way up to actual fighters, and eventually get a shot at the title at Caesar’s Palace. After that, you’ll defend the title against the remaining real fighters in your weight class before retiring and getting to use your created fighter in the other modes, although by that point, you may be kinda sick of using them. Presentation-wise, a pretty good effort is made here to capture the big-fight feel. Commentary is handled by Al Albert (Marv’s brother) and former lightweight champion Sean O’Grady, ring announcing by Jimmy Lennon, Jr., and as mentioned, Mills Lane is the ref. In between rounds, there’s a couple cinematics that show up, either displaying the judges’ scorecards, highlights for the round, or a ring girl carrying the round card. Sadly, while there are ring entrances, the fighters don’t wear robes, and champions don’t have belts or entourages. The commentary is quite decent, although occasionally a step behind the action, and there’s no glaring moments when you ask yourself what fight the commentators are watching. All the bells and whistles you’d expect to find are present, down to the ten-second warning before the end of each round and Mills Lane excoriating a fighter using illegal tactics. I do have a few gripes, of course. None of the “celebrity” boxers become available at any point, for one, which might’ve led to some drunken fun to have Q-Tip battle Jermaine Dupri. Second, although fights rarely get ended in the first couple of rounds, you’re equally unlikely to have the kind of 12-round endurance test that a lot of fights turn into. I also think the learning curve is a bit sticky for new players, especially trying to learn to throw combinations reliably. Finally, and this is minor to be sure, but there’s a bit of product placement of sorts here that’s a bit eye-roll inducing; apparently, EA had worked out some agreement at the time with Ecko, so not only is Marc Ecko in the game, one of the arenas is Ecko Unltd. Arena. Not only that, but the title track is performed by a rapper I’ve never heard of before or since called “O”, who also appears in the game as a fighter, and he also gets a full profile in the instruction manual. Despite those flaws, Knockout Kings 2000 is probably as good as a boxing game got before the advent of the Fight Night franchise. The multitude of available actions in the ring, high-end presentation, and stacked roster are all huge, and the mechanics of the gameplay are quite solid. I’d recommend it for anyone interested in video boxing, but I would advise you to protect yourself at all times. Fantastic roster, anything you could do in a boxing ring can be done here, pretty solid presentation and Career Mode. Fights never quite stretch long enough to have that truly epic feel, AI is surprisingly tough. I’m reasonably sure this is the first (serious, i.e. 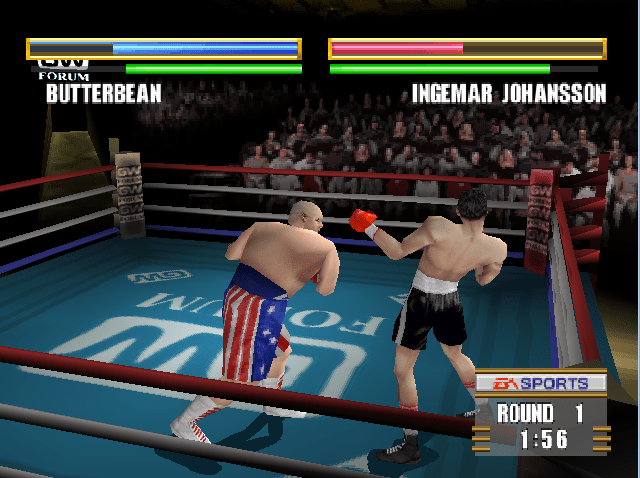 not Punchout) boxing game I ever played, and in the broader context of fighting sports, maybe second only to a WWE game on the N64. I remember precious little of it, except that I’m CERTAIN I just tried to make, essentially, Ivan Drago in the career mode. “For those that just want to trade shots with no regard for speed or technique” would describe me to a T, and even trying to play modern UFC games, my strategy is just “hurt people.” When it doesn’t work, I lose interest and forget about the game. So it must have been with Knockout Kings. I’m sure I played some rounds with the dorm-mates, then quickly moved on to one of the 2K football games. I can clearly remember my 99 yard return in 2K4. I have to give a exaggerated shrug regarding my memories of Knockout Kings. *Though I think I did beat career mode in one or two of the Fight Night games, somewhat fairly legit.